In late February, 60 of the world’s best big mountain skiers and riders gathered at Kirkwood Mountain Resort to compete on its Cirque terrain: a steep, jagged inbounds area that opens only for this once-a-year event. They came to test their big mountain skills in one of the most extreme environments in the world. The South Shore resort was America’s only stop on the six-leg tour, which comes as no surprise. The Tahoe Basin has been a bastion for extreme athletes going back to John “Snowshoe” Thompson, who, from 1856 to 1876, traveled from Placerville, California, to Genoa, Nevada, delivering the mail. In winters, Thompson—known as the father of California skiing—made the journey on 10-foot-long skis, weathering blizzards, jumping cliffs and rescuing stranded travelers along the way. The first ski resorts opened in the 1920s, and the 1960s Olympic Games introduced the world to this snowy sliver of the Sierra, establishing its reputation for incredible terrain and drawing athletes from all corners of the globe. In the decades since, the art of sliding down snow on skis has changed considerably, yet the skiers of the Tahoe Basin remain on the forefront of the sport. Here’s a look at Lake Tahoe’s role in the evolution of skiing, and just a few of the area’s countless athletes who, much like Snowshoe Thompson, take the sport to new heights. Wong grew up in Vancouver, skiing nearby Mt. Seymour. He competed throughout the 1970s and ’80s, created several ballet ski moves such as the famous “Wong Banger,” and starred in many ski movies. In 2000, Ski Magazine voted Wong one of the 100 top skiers of all time, and just this past April, he was inducted into the U.S. Ski Hall of Fame. While on tour, he’d often compete at resorts around the Tahoe Basin, and moved to Truckee in the winter of 1988 to ‘89. The International Ski Federation recognized freestyle skiing as a sport in 1979. The first World Championships occurred in 1986, and it was a demonstration sport in the 1988 Calgary Olympic Games. Heavenly still hosts one of the best bump skiing events in the country, Gunbarrel 25. The competition, which began in the late ’80s, challenges participants to bump down 1,700 vertical feet of steep, moguled, double black diamond face run—25 times. McKinney epitomized the extreme ski movement before it existed. He had a need for speed and the desire to try every sort of adventure available. He survived a helicopter crash in Chile, hang glided off Mt. Everest (where bad weather forced him to take off from 19,000 feet versus the summit as he’d planned) and survived a 100-foot rock climbing fall from Donner Summit that broke his back in three places. McKinney held the title of fastest skier in the world for five years before a new record was set. Later, in 1987, McKinney beat his own previous best when he flew downhill at 130.4 miles per hour, a record that was surpassed within the year. McKinney never held the speed skiing record again; despite surviving falls and crashes of all sorts, a drunk driver killed him while McKinney slept in his car. Though resort regulations discouraged some from freestyle, a new sport—extreme skiing—emerged thanks to the ski movie industry. In 1983, Scot Schmidt was skiing at Squaw when one of Warren Miller’s cameramen discovered him. His appearance in the Miller film Ski Time introduced the world to Schmidt’s style of skiing off big cliffs; he’s since been called the godfather of freestyle skiing and the first professional extreme skier. Greg Stump’s 1988 rockumentary-style Blizzard of Aahhh’s has been lauded as one of the best ski movies of all time. It opens with South Lake Tahoe-based Glen Plake, famous for his 15-inch Mohawk as much as his athletic endeavors, skiing at 98 miles per hour, and also features Schmidt and skier Mike Hattrup. “Greg Stump really put this whole extreme ski thing in the public view,” says Wong. The development of terrain parks in the early 1990s also helped. Rails, jibs, kickers and jumps allow riders to practice tricks in a fairly controlled setting before trying those skills on natural features. “What we would do with skis on the ground, for the newer skiers, it’s how many twists they can do, how high they can jump,” says Wong. “Those types of skiers” included Tahoe legends like Shane McConkey. Born in Vancouver, McConkey moved to California at age 3, and later attended Burke Mountain Academy in Vermont. He began starring in ski movies and introduced the world to Saucer Boy, his endearing, whiskey drinking alter ego who parodied his own industry and professional skiers who took themselves too seriously. McConkey brought an irreverence and sense of fun back into the sport. In Matchstick Productions’ Ski Movie II: High Society, McConkey famously says “Just ski down there and jump off something, for crying out loud,” a line that became the mantra for ski fans the world over. McConkey is also credited with revolutionizing powder skiing; he realized that skiing powder resembled skiing water more than snow and mounted a pair of water skis, then tore down a British Columbia peak. He sketched up a design for skis based on this rocker design, changing forever the way people shred powder. McConkey was far from the only local legend. Schmidt, Plake, brothers Robb and Scott Gaffney, as well as brothers Eric and Rob DesLauriers, all contributed to the extreme ski movement, going down lines and hucking off cliffs previously thought impossible. Today, trail and landmark names around Squaw Valley commemorate many “extreme” accomplishments. Beck’s Rock, in the middle of the Palisades, commemorates Greg Beck, who dropped 100 feet during the filming of his brother Craig’s classic ski film Daydreams. The name fails to commemorate Greg’s best friend, who broke both legs attempting the same run a day earlier, and, more recently, skier Mike Wilson, who threw double back flips off the rock. Just to the right of Beck’s Rock is Schmidiots, a 67-degree and 100-foot-long run made famous in 1983 by Scot Schmidt when filming for Warren Miller. A permanently closed area on the right side of the Tram Face (known as the Rock Pile) includes a run called Sylvester’s Slot, after Rick Sylvester, a former member of the Squaw Valley Ski School and the James Bond stuntsman who famously performed a ski BASE jump in The Spy Who Loved Me. Sylvester’s Slot is an open face that tapers to an almost impossibly narrow chute. Extreme skiing became big fast, and the first international competition, the World Extreme Skiing Championship (WESC), began in Valdez, Alaska, in 1991. The brainchild of Valdez resident Mike Cozad, the first WESC invited 37 competitors—including South Lake Tahoe resident Darren Johnson, who grew up skiing with Plake—to slide down the steep Chugach Mountains. “It was an honor to be chosen and considered one of the athletes who should be there,” says Johnson. 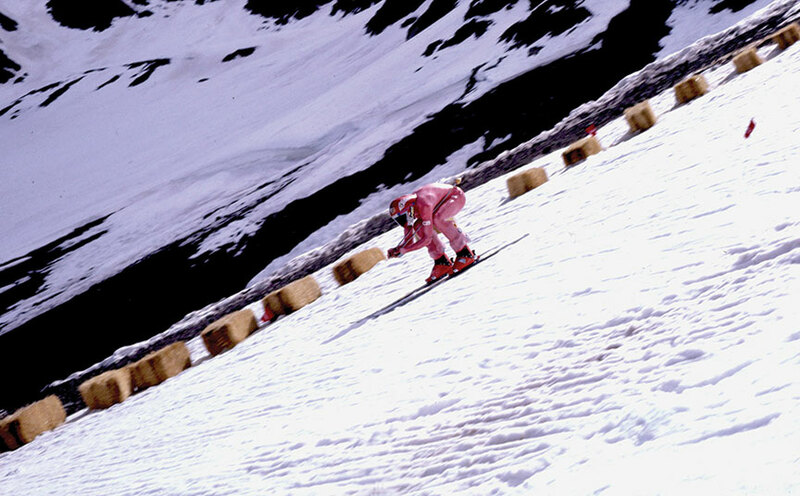 Johnson ultimately finished ninth while Doug Coombs, another forerunner in the sport of extreme skiing, won the WESC’s first competition. Though, as Johnson notes, “the safety and venue were well thought out,” tragedy still struck the WESC in 1993, when 28-year-old skier Wilbur Madsen of Steamboat Springs, Colorado, fell through a cornice while peering over the edge for a skiable route down the Chugach Mountains. Yet the competition continued until a dispute with Red Bull. In 2000, the energy drink company decided to host its own extreme championship in Girdwood, Alaska, the week before the Valdez event. By 2001, the WESC ran out of money. Still, some credit the event as a precursor to the X Games, and it introduced the world to the big mountains of Alaska. With extreme skiing comes extreme risks, and Tahoe lost its share of icons to the sport. “I’ve buried a few friends,” says Murtha. He tells the story of one of his best friends, Paul Ruff, a 28-year-old living in South Lake Tahoe who skied all day and bartended nights. “The record was being pushed for world cliff jumping,” says Murtha. Ruff held the record but it was taken from him, so he scouted around Tahoe looking for a cliff that would allow him to get his record back, finally choosing a location in the Kirkwood backcountry. Ruff coordinated with Warren Miller, and the day of the jump he had plenty of logistical support—snowcats, snowmobiles—as well as photographers and videographers. Though Murtha didn’t want Ruff to jump, he went out to support him as a friend. “I watched him jump to his death,” Murtha said. Ruff hadn’t been able to clear the rock precipice. Murtha helped load Ruff into the helicopter and was later a pallbearer at his funeral. Murtha says that ever since Ruff’s death, people insisted that extreme skiing was the future of skiing. But he’s seen too many broken backs, punctured lungs and lost lives to agree. “I think when it morphed from extreme skiing to cliff jumping, that’s when it took a turn for the worse,” Murtha says. Ruff is far from the only extraordinary athlete that the Tahoe Basin has lost. McConkey, one of the sport’s biggest stars, pioneered more extreme and dangerous sports. He began BASE jumping and added skis—skiing off enormous cliff faces and then deploying a parachute—and pioneered wingsuit flying. In March 2009, McConkey was skiing in Italy’s Dolomite Mountains. He skied off a cliff and performed a double back flip, then intended to fly off in his wingsuit and parachute safely to the ground, but something went wrong and he struggled to release his skis and never deployed his parachute. X Games competitor C.R. Johnson, who suffered an injury in 2005 and was in a coma for months, fell while negotiating a chute at Squaw Valley in 2010 and hit his head; his helmet failed to save him. An avalanche killed Squaw Valley skier Kipp Garre in 2011. Doug Coombs, the winner of that first WESC, fell about 1,500 feet while navigating a couloir in France in 2006. Darren Johnson was skiing the Kirkwood backcountry in 2009 when an avalanche hit him. “I caught a little slide, was pushed into a rock and suffered a major head injury,” he says. In part because of the associated risks, extreme skiing has evolved to big mountain skiing. “The word ‘extreme’ burnt itself out,” says Kevin “Coop” Cooper, brand manager at Kirkwood. He notes that big mountain skiing means negotiating extreme terrain fluidly—not just pulling tricks and aerials. “You have to ski top to bottom like water,” he says. Cooper would know. The 20-year Kirkwood veteran notes the mountain began hosting North American tours in 1993 to ‘94. “We have a long history with big mountain events,” he says. However, just in the past year, the stop on the Freeride World Tour has gone from a four-star to a five-star event. That brings us back to the 60 athletes waiting to try out the Cirque terrain. Organizers scheduled the competition for five days, though it would only take place one of the days. They chose the very best and safest conditions for skiing and riding. “We wait for the bluebird day,” says Cooper. The 60 athletes are not allowed to ski the terrain—a steep combination of grabby snow and exposed, volcanic rock—beforehand. Held for skiers and snowboarders in men’s and women’s categories, it is one of the world’s premier big mountain events. The tour wound up in Verbier, Switzerland, where two Tahoe heroes placed: Squaw’s Ralph Backstrom was named the 2013 World Champion in men’s snowboard, and Squaw’s Jackie Paaso taking third in the women’s ski. Kirkwood will be the final stop for the tour in 2015. While big mountain skiing is the latest incarnation of the sport, practitioners have already experimented with parachutes, paragliders and wingsuits. So how will the sport evolve next? Will skiers return to the snow or continue looking for higher cliffs and bigger air? Either is possible, though it’s a fairly good bet that the sport will, as it has constantly in decades past, continue to progress. Reno resident Alison Bender earned the nickname “Hang-Time Ali” for once going over a jump at Heavenly. She has managed to convince herself that it wasn’t sarcasm.